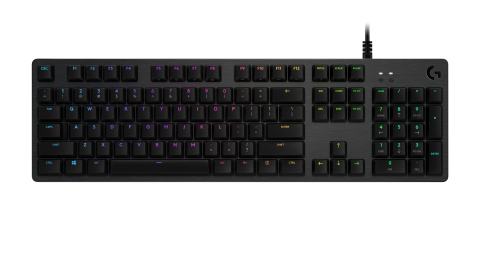 NEWARK, Calif. & LAUSANNE, Switzerland--(BUSINESS WIRE)-- Logitech G, a brand of Logitech (SIX: LOGN) (NASDAQ: LOGI) dedicated to creating high performance gaming gear, today announced the Logitech® G512 Mechanical Gaming Keyboard and a new mechanical gaming switch option, GX Blue. The Logitech G512 is a high-performance mechanical gaming keyboard built on the award-winning design of the G413 and G513. The keyboard offers three different key switch choices – Tactile, Linear and the new GX Blue. The introduction of the GX Blue key switch, which will also be available on the Logitech G513 Mechanical Gaming Keyboard, further expands our lineup of mechanical key switches available on our industry leading keyboards. The Logitech G512 Mechanical Gaming Keyboard with a choice of Tactile, Linear or GX Blue key switches is expected to be available on logitech.com and at select retailers in Asia Pacific beginning June 2018 for a suggested retail price of $99.99. The Logitech G513 Mechanical Gaming Keyboard with GX Blue key switches is expected to be available in the United States, Canada and select countries in Europe beginning June 2018 for a suggested retail price of $149.99. The G Hub early access is expected to be available in July 2018. For more information, please visit our website, our blog, or connect with us @LogitechG. Logitech G, a brand of Logitech International, is the global leader in PC and console gaming gear. Logitech G provides gamers of all levels with industry-leading keyboards, mice, headsets, mousepads and simulation products such as wheels and flight sticks - made possible through innovative design, advanced technologies and a deep passion for gaming. Founded in 1981, and headquartered in Lausanne, Switzerland, Logitech International is a Swiss public company listed on the SIX Swiss Exchange (LOGN) and on the Nasdaq Global Select Market (LOGI). Find Logitech G at www.logitechG.com, the company blog or @LogitechG.